Observations: Tell the slim-ball Qaddafi "No!" Now there is the absurd possibility of the loathsome and contemptible Muammar Qaddafi coming to the United Nations, and staying in somewhere in the United States beyond the property donated to the UN. He wanted to stay in New Jersey, a situation that would be intolerable, and Jersey officials nixed that. Good for them. Although Scottish and British officials bear substantial responsibility for this travesty, Qaddafi is the one who plans to flaunt his contempt for the United States by coming to the U.N. and venturing beyond its limited confines to pitch a tent in some comfy spot (he’s a nomad, you know). 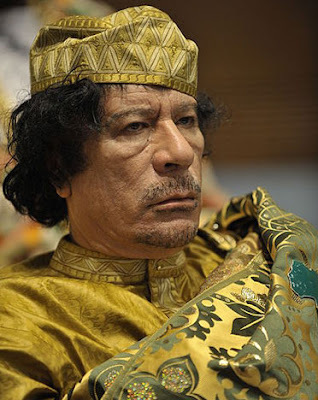 Qaddafi ignored United States wishes and welcomed the terrorist Megrahi as a triumphant hero. If President Barack Obama allows Qaddifi to travel one foot beyond what he is allowed as a visitor to the UN, that will be a clue that there is nothing about the United States Barack Obama will strongly defend. If Qaddafi comes to the UN, let him pitch his tent in a UN parking lot, or perhaps he can sleep on a couch in the lobby. This arrogant terrorist sympathizer must not be allowed on US territory.